joined the fray an hour later for a combined 437 runners on the course at the same time." Indeed, it was warm -- even warmer than last year's "Pineapple Express" during Rocky. According to the race website the thermometer hit 77° F. on Saturday, the highest temperature on race day since ten years ago. Add in a good dose of humidity and you can see why it felt like instant summertime to the runners, even those who live in southern Texas. Despite our little winter getaway to warmer climes the past three months, I don't think Jim and I have experienced any days quite this warm either. I encouraged (nagged, perhaps!) him to drink plenty of fluids and take adequate electrolytes during the 50-miler. It certainly looks tropical along the course in early February. Note red flagging for race. Jim apparently did everything right because he ran well, had no problems for fifty miles, and finished in a time midway between the two estimated times he projected in his split chart. He's pleased with his time (11:38:51) and place (99th of 174 finishers and 198 starters, and 2nd of 7 in the men's 60-69 age group). That was my "executive summary." Continue on if you're interested in more race information, stories, and photos. This entry is exceedingly long and there are about fifty photos so I've divided it into three parts. Just click on "next" at the bottom of each page to continue reading about the race. I did not put three separate links on the topics page. Not so the Rocky Raccoon race. It's more like the majority of ultras we run. Even though the event has drawn 400-500 runners in recent years, it is much more of a volunteer effort with RDs Joe and Joyce Prusaitis supported by four Texas running clubs: the Hill Country Trail Runners (HCTR), the Houston Trail Runners EXtreme (H-T-Rex or HTREX), the North Texas Trail Runners (NTTR), and the Seven Hills Running Club from Huntsville. Signs and orange and pink flagging direct runners through this intersection on the Chinquipin Trail. 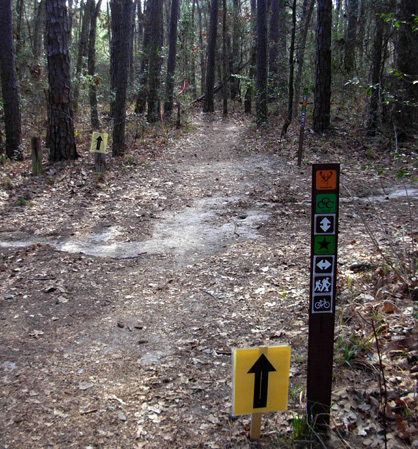 Flagging directs runners to the right at this intersection of the Chinquipin and CCC Trails. The turns and intersections I saw were clearly marked but during the race some runners apparently went off course on the "dam loop." The course was modified this year and some folks weren't paying adequate attention. Jim and the vast majority of the other runners found their way just fine. 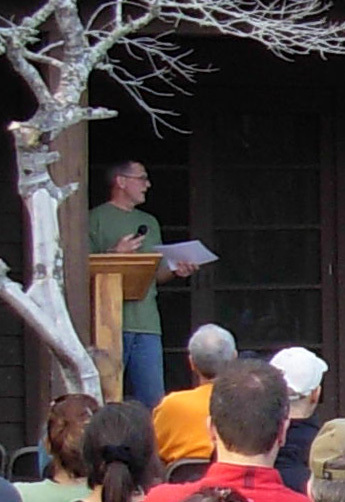 Jim studied the course maps closely and had the advantage of running the loops prior to the race. Both the 50- and 100-mile courses were changed this year. 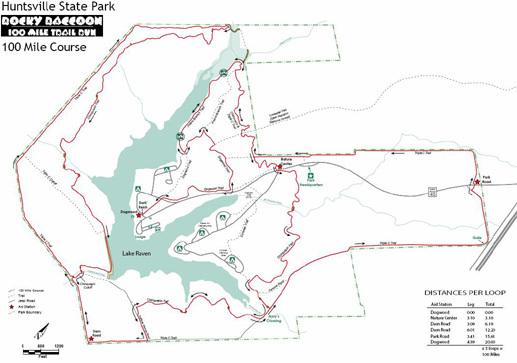 Most runners apparently favored the new course because it included more single-track trail and less out-and-back to the old "Far Side" and "Highway" aid stations. Jim also preferred the new course to the one he ran last year. Even though it's fun to see other runners on multiple out-and-back sections, we both prefer doing loops. Somehow it's less tedious and we feel like we're making more progress. The 100-mile course (in red, below) still consisted of five identical 20-mile loops, just in a different configuration from last year. I realize you can't read this map that I copied from the website because it is so small. I'm putting it here so you can get an idea of the various loops in the race this year. The pdf. map on the website is larger and more clear but it may not be there next year if the course changes again. 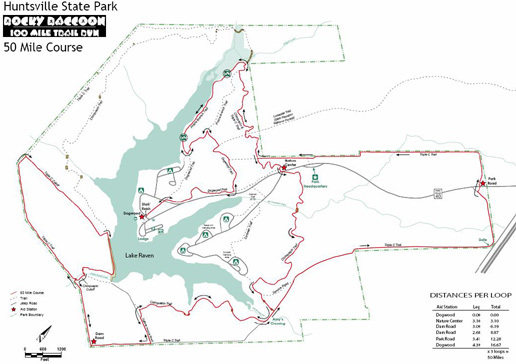 The new 50-mile course was three 16.67-mile loops, identical to the 100-mile course except in the dam area -- the 100-milers had a longer loop on the far side of the lake (upper left part of map). Again, there's a larger pdf. map at the link but it may change in the future. Start/finish area (Dogwood AS) two minutes after the 50-milers began running. Note the red chip timing mat. With the course changes came changes in all of the aid station locations and three of their names. This part will probably make sense only to folks who've run Rocky previously but it might also be instructive to runners considering it in the future. 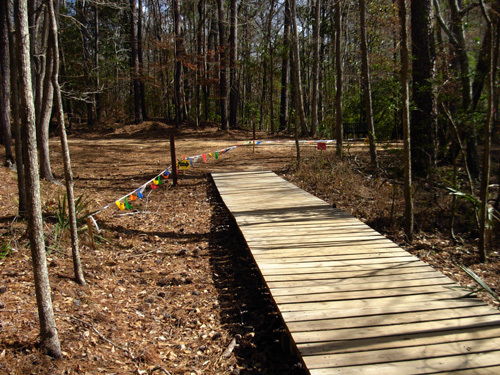 The main aid station at the start/finish (where runners finished each loop and began another) was moved form the lodge area to a more open, grassy area at the end of the Dogwood Trail to minimize running on pavement and reduce the impact around the nearby lodge (believe me, over a thousand people trampling that area during the Sunmart race in December must have had an impact). This busy AS was renamed "Dogwood." Crews hung out here. 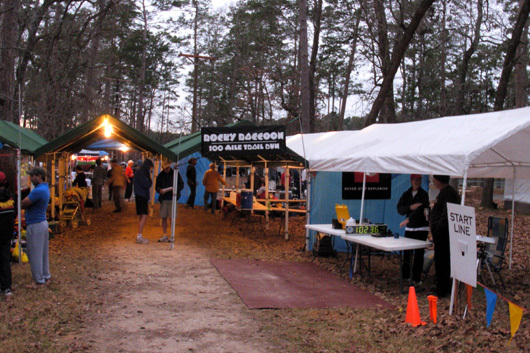 Drop bags were allowed here in both races (it was the only drop bag location for the 50-milers). The Dam Road AS retained its name but moved from the spillway service road to the southern corner of the CCC Trail 3/4 mile away. Crews were not allowed here. Drop bags were allowed in the 100-mile race but not the 50-mile race. Runners in both races hit this AS twice per loop, so it stayed busy (~ six and twelve miles into the 100-mile loop and ~ six and nine miles into the 50-mile loop). 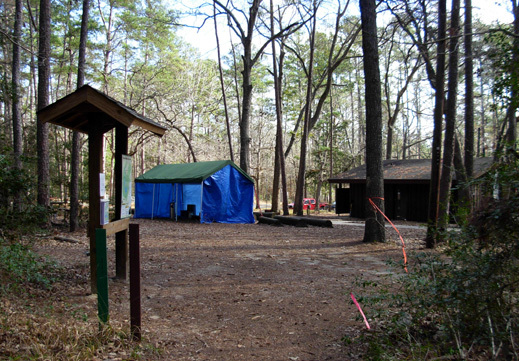 The Nature Center AS on Friday morning, before it was stocked for the race. The "Far Side" AS was eliminated; I believe volunteers manned the north end of that loop to record 100-milers' numbers, however. The previous "Highway" AS near the park entrance (right side of map above) was moved a quarter of a mile away, on the other side of the road, and renamed "Park Road" AS. It was very accessible for crewing but not a drop bag location. Runners came through this station once per loop a little over four miles from the end of each loop. 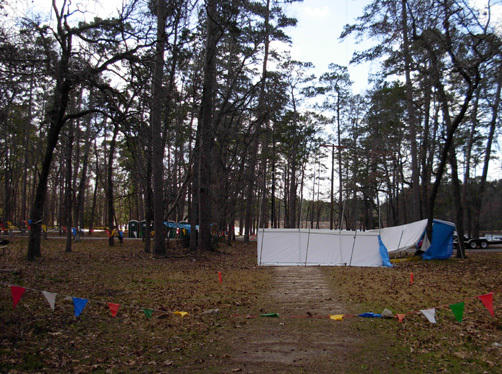 The "Site 174" aid station near our campsite was eliminated this year. A new AS was placed at the Nature Center on the main park road, making it very accessible to crews. Runners could not leave drop bags here. 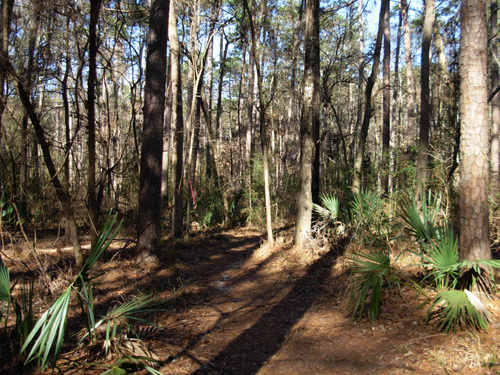 They hit the "Nature" AS once per loop, about three miles into each loop. 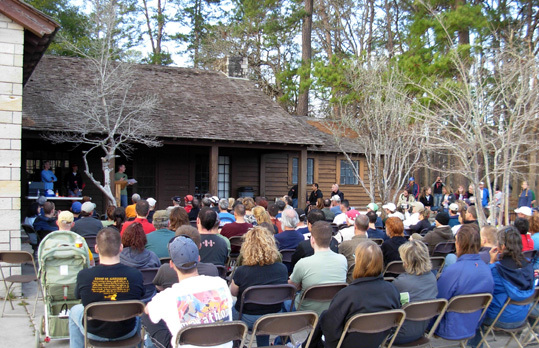 By the time we made our way over to the lodge for packet pick-up and the briefing, it was almost time for Joe to begin. We didn't have much time to talk with other friends there. Most of the people we know were in the 100-miler. Many of them skipped the briefing: been there, done that, I guess. We were already familiar with the drill from last year's race and the very complete website but we wanted to be sure we had all the latest information about the weather, course changes, chip timing, etc. I had no trouble with the 20 MPH speed limit the first two times I went out to the entrance (about three miles one way) to crew for Jim because I rode our bike, but the third time in the truck it was hard for me to drive the speed limit. The entire rest of the month we stayed in the park, however, we saw very few people pulled over for speeding. I guess the park has had trouble previously with race crews speeding too much. Beware of this if you have a crew at Rocky. By the way, it was fun crewing on the bike all day Saturday! I don't like crewing in our truck. It's noisy and so big that it's a problem finding parking places at many aid stations. This is the first time I've had access to a bike during a race or had aid stations so convenient for crewing with a bike. I could have easily crewed Jim at the Nature Center AS each time I went out to the Park Road AS; I never stopped at Nature because it was too soon after seeing him at the start/finish/turn-around (Dogwood AS). Crews weren't supposed to park right at the Park Road AS but I could take the bike very close to the tent, as you can see in the photo below. I carried Jim's supplies in my Camelbak back-pack and fluids in the bike's bottle racks. 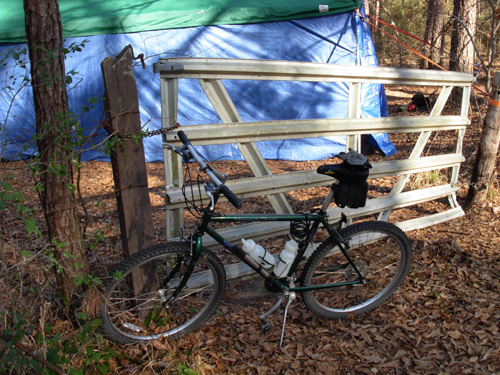 I kept riding back and forth between the camper, main aid station, and Park Road station during the day, racking up a good number of cycling miles on the hilly roads. I drove the truck out the third loop, however, because it would be dark when Jim finished up. We don't have a light on the bike and I knew Jim would want to ride back to the camper in the truck when he was done. Back to the briefing . . . It was hard for us to sit still because we were waiting anxiously for the transmission shop to call about our truck. They finally called to say they'd be delivering it to us soon. By then the briefing was winding down so we left to walk back to the camper. We regretted not being able to hang around to talk to some folks we knew. 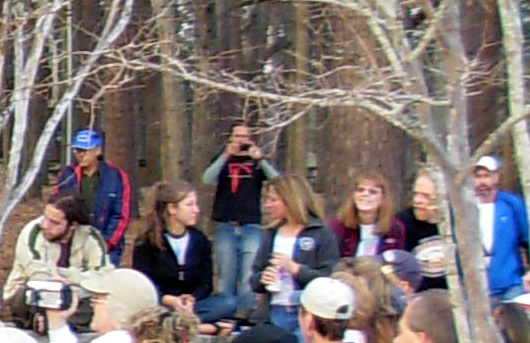 Turns out, we would have had plenty of time for chit chat with friends Anne and Matt Watts (in purple and black jackets, seated toward the right below), Beth Simpson-Hall and her daughter (in blue and navy jackets in center below) and husband Larry (not shown), and others. I wasn't the only one taking photos! Note the guy in the center back and the woman below left. The truck wasn't delivered until after we ate supper (story in last entry). Jim drove it around the park a little while to see how it behaved: not real well. We didn't learn until the repair shop opened on Monday that the sluggish shifting Jim noticed was considered "normal" for a few days, so of course we worried about it the rest of the weekend! Rocky has a pre-race dinner but it and the post-race brunch both cost extra ($18 and $15 per person, respectively). We passed on both, as we did last year. Unless such meals are included in our race entry we usually prefer to prepare our own food. We do like having the option to pay for meals, shirts, and other amenities separately so we can choose which we want and which we don't. Jim essentially paid for the entrants' sweatshirt at Rocky but since he registered a couple days after the shirt deadline, he didn't receive one this time. He knew the risk and didn't whine or complain. Last year he also registered past the shirt date, lucked out, and got an extra shirt.